Germany’s Markus Rehm smashed his own world T44 long jump record on Friday, leaping 8.40m to win his third successive title at the IPC Athletics World Championships in Doha. The London 2012 Paralympic champion had jumped his previous best of 8.29m in May but added 11cm to that mark in Doha for a leap that would have won Olympic gold in the British capital three years ago. The distance is also just 1cm off Greg Rutherford’s winning jump from the IAAF World Championships in Beijing in August and saw Rehm secure victory by over a metre from Netherlands’ Ronald Hertog with 7.26m. “When I had the world record at 8.29m I thought that it might be difficult to beat it, but to then go on and get 8.40m was really special,” said the 27-year-old single-leg amputee, who competes wearing a carbon fibre blade prosthesis following a wakeboarding accident when he was a teenager. 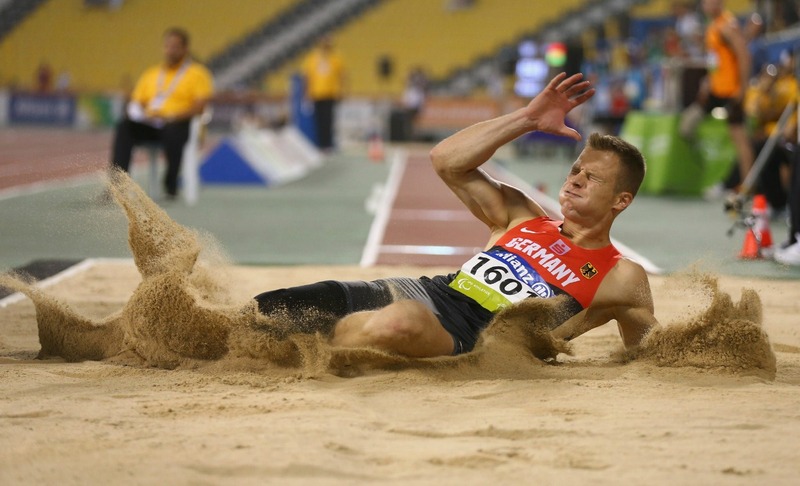 Earlier this year, Rehm spoke with AW at the London Anniversary Games where the TSV Bayer 04 Leverkusen athlete explained how he had been denied a second national title despite recording the longest jump at the German Championships for the second year in a row. The decision followed questions about whether Rehm’s blade gives him an advantage when competing against able-bodied athletes, with the situation requiring consideration because of the distances he is achieving. Co-captain of the GB team, Paul Blake, added another medal to the haul of seven claimed by the British team on the first day of the championships, securing T36 400m silver when he ran 54.58 behind Russia’s Evgenii Shvetcov with a 53.70 championship record. Cuba’s Omara Durand clocked 53.05 to break an 11-year-old world T12 400m record, while China’s Cuiqing Liu beat Brazil’s defending champion and world record-holder Terezinha Guilhermina in the T11 400m, clocking a 56.68 Asian record. Six-time Paralympic gold medallist David Weir safely progressed through to Saturday’s T54 1500m final, finishing second in the first heat, while there was a big crash in the third heat and five athletes did not finish the race. Britain’s Sabrina Fortune placed fourth in the F20 shot put with a PB of 12.27m, Holly Neill finished fifth in the F41 discus with a throw of 22.68m and Polly Maton placed eighth in the T47 long jump with a 5.19m PB. Their team-mates Isaac Towers and Ben Rowlings both booked their spots in the T34 400m final, while Maria Lyle made it through to the T35 200m final and Samantha Kinghorn the T53 100m final after her 200m bronze won on Thursday.